Even set deep into a rectangular slab of marble, eyes have an unequivocally humanizing effect. In Nature Study (Velvet Eyes) by Louise Bourgeois, they feel wide and cartoonish. With the absence of a mouth, they seem innocent in their speechlessness. The piece is both whimsical and haunting. In some ways, it is the perfect example of Bourgeois's oeuvre. Born in Paris, Bourgeois moved to New York with her American husband in 1938, going on to become both an American citizen and one of the most influential artists of the 20th century. She died in 2010, leaving a legacy of artwork in a variety of media, from drawing and painting to sculpture and installation. Through the themes of domesticity, sexuality, mortality, and the subconscious, Bourgeois articulated the intimate traumas and tensions of her psyche and emotional landscape, using whatever materials necessary to transform repression into physical form. Before her death, Bourgeois said, "The artist has the privilege of being in touch with his or her unconscious and this is really a gift—it is the definition of insanity; it is the definition of self-realization." 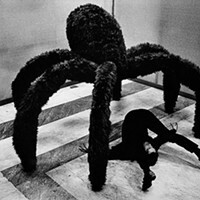 Frances Morris, director of the Tate Modern in London, who curated a retrospective of Bourgeois's work in 2007 and conducted extensive interviews with her, said, "What I think is very interesting about Louise Bourgeois is that she had this very traumatic and vivid childhood. And I think that Bourgeois realized early on that she needed that trauma, that she fed off it." She described Bourgeois as an unexpectedly tiny and ferociously intelligent woman. Of working with hard materials such as marble, which she began to use in the 1960s while in Italy, Bourgeois said, "The resistance of the material is part of the process. I can express myself only in desperate fighting position." 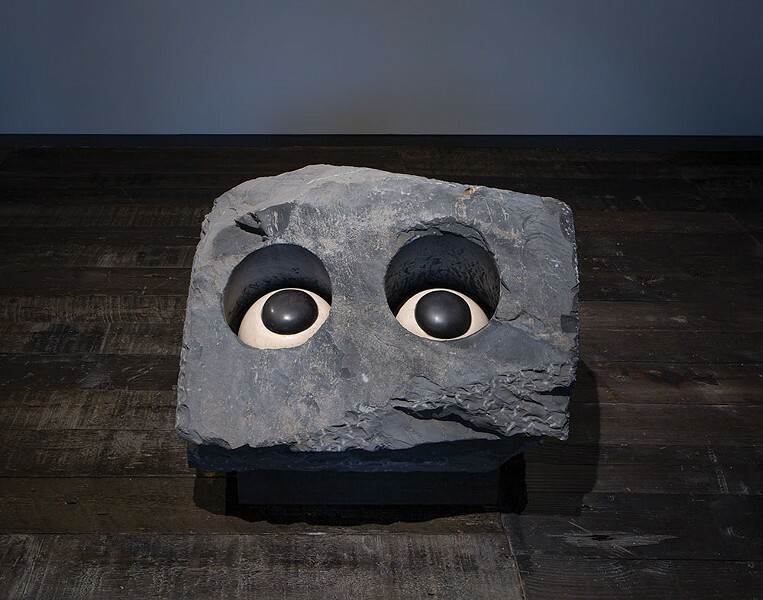 In Nature Study (Velvet Eyes), the majority of the stone slab has been left rough while the side which peers out at the viewer has been smoothed to seem skin-like. It's the juxtaposition of polarities (hard and soft materials, humorous and serious elements) which make Bourgeois's work so layered and evocative. The piece is on exhibit at MASS MoCA's new Building 6, the Robert W. Wilson Building, with a small group of Bourgeois's marble sculptures, many of which have never been seen before in the United States. Writes Mass MoCA curator Susan Cross, "Together, the intimate selection of works illustrates the power of Bourgeois's unique work to articulate the ineffable fervencies of anguish and passion that define the human condition, and to picture the yawning desire for connection that keeps our ultimate solitude at bay." Building 6 just opened in May, and doubles the museum's square footage, making Mass MoCA the largest contemporary art museum in America. One Bourgeois sculpture, Pass, weighs 15 tons, which required that the gallery be built specially to house the exhibit. 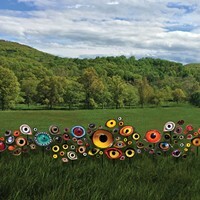 Nature Study (Velvet Eyes) is on view at Mass MoCA at least until 2018. Massmoca.org.